Gilmore Girls: A Year in the Life is a miniseries revival of the cult television show Gilmore Girls set a decade after the end of the original series. Lorelai Gilmore has been dating boyfriend Luke for ten years, while her daughter Rory has become a struggling freelance journalist unsure of her own relationships. Her ex-boyfriend Jess encourages Rory to write her autobiography. Lorelai is uncomfortable with the idea, and takes off on a hiking trip to find herself. Rory's grandmother Emily is out of sorts after the death of her husband. When Lorelai returns, she and Luke get married and Rory discovers that she's pregnant. 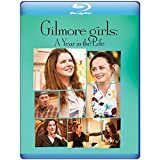 DVDs Release Dates is the best source to find out when does Gilmore Girls: A Year in the Life come out on DVD and Blu-ray. Dates do change so check back often as the release approaches.